New arrival: Samsung Flip interactive digital flip chart display « Tech bytes for tea? The Flip’s portable, wheel-based stand allows it to be moved to any room where a meeting or huddle is held. Up to four different participants can introduce content or annotate directly on screen at the same time using either their fingers or a dual-sided pen. “Samsung is transforming how meetings are conducted with the Samsung Flip. Traditional meeting tools make it easy for participants to feel disengaged and for vital ideas and discoveries to become lost. Today’s workers require more powerful and flexible technologies, and we truly believe that our new Samsung Flip display offers endless possibilities for driving impactful collaboration to help businesses work better, smarter and faster,” said Gan Ta Loong, General Manager, Enterprise Business at Samsung Electronics Singapore. In doing so, each user can customize his or her own writing style, size and colour, with each notation made clear and visible by viewer-friendly UHD resolution. Likewise, users also can import personally-stored content onto the Flip display’s screen and introduce fresh ideas to the discussion. Participants do not need a specialized touch pen to interact with the screen, and can erase notes through a quick palm swipe. 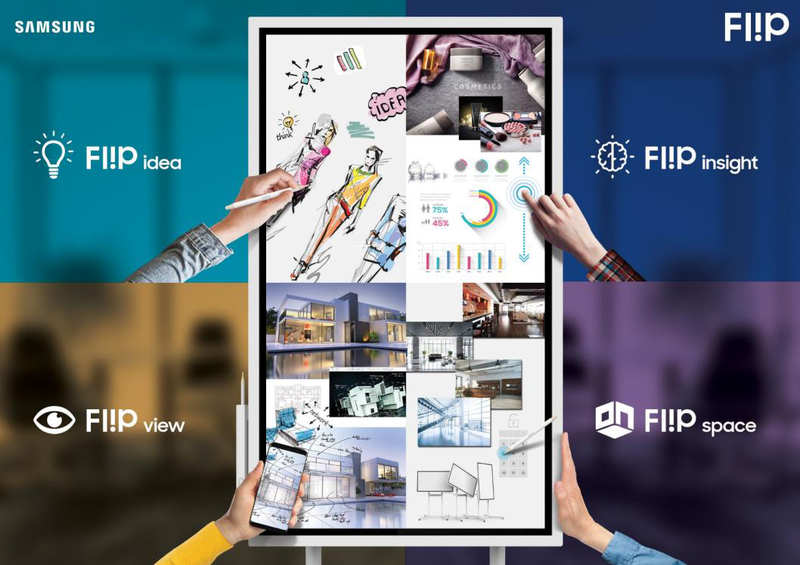 “The introduction of the Samsung Flip in our conference facilities will allow discussions to be more dynamic, fun and creative, where participants can illustrate their ideas in writing or through drawing on a digital board. The discussion content can also be digitally saved and exported without any hassle. We are thrilled that this technology will help enhance our meeting experiences, and is a brilliant presentation tool for those looking to wow their guests,” said Peter Mainguy, General Manager of The Ritz-Carlton, Millenia Singapore. Flip users also can access up to 20 pages of writing space, with embedded search functionalities available to instantly direct participants to specific content. This continuous, rolling stream avoids the lost time and interruptions that often result as participants have to search through multiple sheets of paper or lines of notes to locate a specific detail. When coupled with its height-adjustable stand, the Flip also maximizes available writing space at users’ preferred positions. Should a meeting require more centralized, roundtable-style discussion, users can remove and connect the Flip display to a compatible wall mount. As meetings wrap up, the Samsung Flip display securely stores all content within a central database, eliminating the need for cumbersome recaps or handwritten transcription. An airtight, password-based protection system safeguards meeting details and ensures that only approved users can access the information. Once logged in, meeting facilitators and participants can download and share featured content through email or traditional printing. Users additionally can save meeting notes to a USB drive or other external sources. An early adopter of Samsung’s latest innovation is The Ritz-Carlton, Millenia Singapore – a 608-room luxury hotel with 50,000 square feet of meetings and events space, equipped with state of the art conference facilities. The Ritz-Carlton, Millenia Singapore is the first hotel in Southeast Asia to deploy a pilot fleet of the Samsung Flip display, augmenting their digital offerings in conference facilities and minimizing paper footprint. This entry was posted on Monday, March 12th, 2018 at 8:00 pm and is filed under Accessories, Announce, Availability, Business IT, Enterprise IT, Gadgets, gadgets, newArrivals, Press Release, Samsung. You can follow any responses to this entry through the RSS 2.0 feed. Both comments and pings are currently closed.